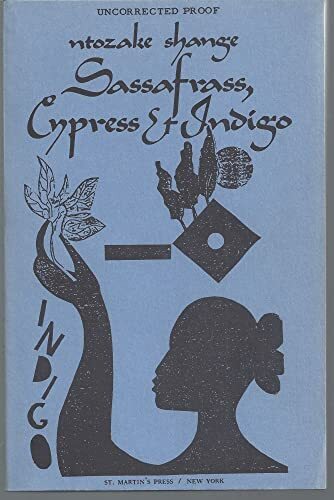 SASSAFRASS, CYPRESS & INDIGO; A novel. by SHANGE, Ntozake: St. Martin's, NY 9780312699710 First Edition. - Second Life Books, Inc.
Home SHANGE, Ntozake SASSAFRASS, CYPRESS & INDIGO; A novel. SASSAFRASS, CYPRESS & INDIGO; A novel. Title: SASSAFRASS, CYPRESS & INDIGO; A novel. NTOZAKE SHANGE is a renowned playwright, poet, and novelist. Her works includes Some Sing, Some Cry, the Obie Award-winning for colored girls who have considered suicide/when the rainbow is enuf, Betsey Brown and Liliane. Among her honors and awards are fellowships from the Guggenheim Foundation and the Lila Wallace-Reader's Digest Fund and a Pushcart Prize. Tony and Grammy Award-nomiated Shange is a graduate of Barnard and recipient of a Masters in American Studies from University of Southern California. She lives in Brooklyn, New York.